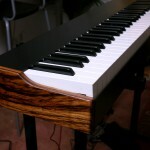 This article is about my third self build masterkeyboard. This question is quickly answered. 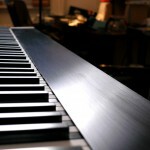 None oft the keyboards which are on the market are stage-proofed or do not suit my needs. You can’t find a masterkeyboard with an intergrated power supply on the market. Please contact me if I’m wrong. To get a nice keyboard under 20kg is not that easy. 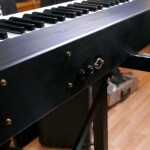 A keyboard which is fitted in a plastic frame and is modified to be as light as possible feels different than a keyboard which is build in a steel frame. I own a ACUNA88 which is equipped with a very light keybed. 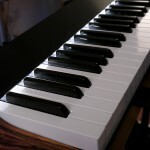 There are two major drawbacks: At first the keys are a bit sluggish, so playing fast piano lines might be difficult. Second the keys are bouncing. The goal is, to find a good compromise between weight and playability. Doepfer: Nice idea with the case integrated. But every time you bash it against a door or the guitar-amp of your guitarplayer, the force is directly transferred to the keys. That’s why you find a lot of not-working Doepfer Keyboards on eBay. Fatar / Studiologic: If you search the internet for studiologic you find posts and articles of disgruntled people complaining about faulty electronics. My ACUNA88 has this too. A few times it quitted suddenly. 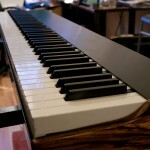 Kawai: The VPC-1 has a nice keyboard, but the housing is too big and with 29,5kg to heavy. I spared USB because I made a few bad experiences with USB on stage. The plug is too small and not locked. 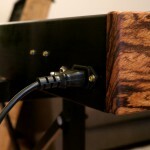 I prefer a nice power-plug and the typical DIN-sockets for MIDI. If I ever want to use USB (for example to integrate a tablet to my setup) I can easily use a cheap MIDI-USB adaptor. 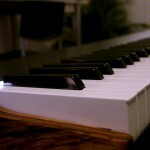 It’s possible to add pitch & modulation to the electronic (which can not be bought btw.) but I don’t need that on my 88 key too. I’m proud of this piece. It has a awesome playability and looks nice. The workmanship is solid but it also weights less than 20kg. The integrated power-supply and the slim design top off this stage-proofed eye candy.